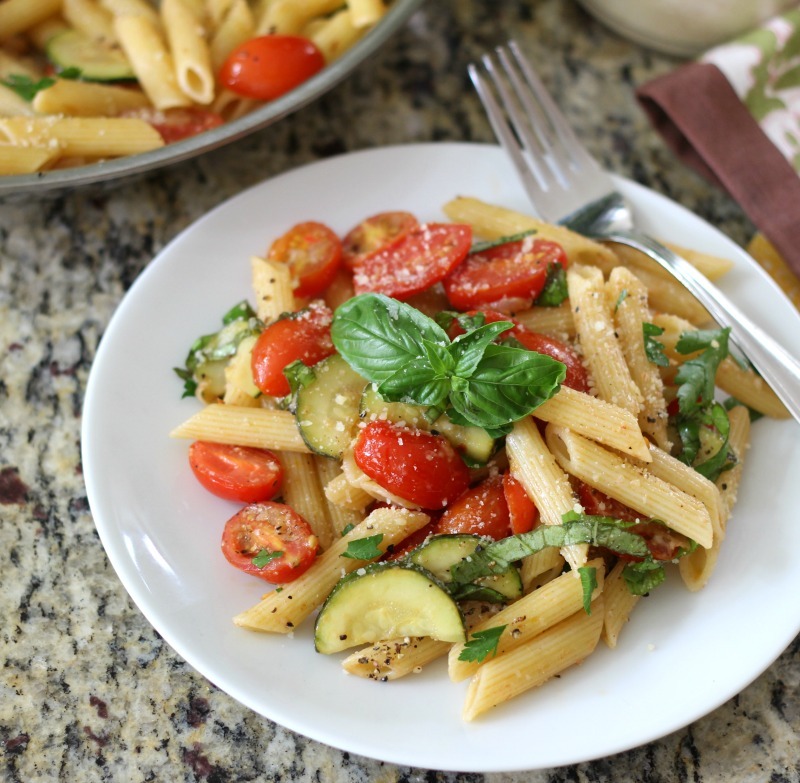 I am all for fresh produce and anything pasta. Combine the two together and you have a super delish meal to please the family. As you can tell I have a pasta dish in store for you today. It just screams summertime! My absolute favorite thing about the Spring and Summer is fresh produce and walking around the Farmers Market. This weekend I went to the Farmers Market and let me tell you it was ugly out. 59 degrees and of course it started to rain on me. Oh well, I popped on my hood and still bought some fresh produce, along with some local honey. It’s amazing how many people come out to the Farmers Market rain or shine. 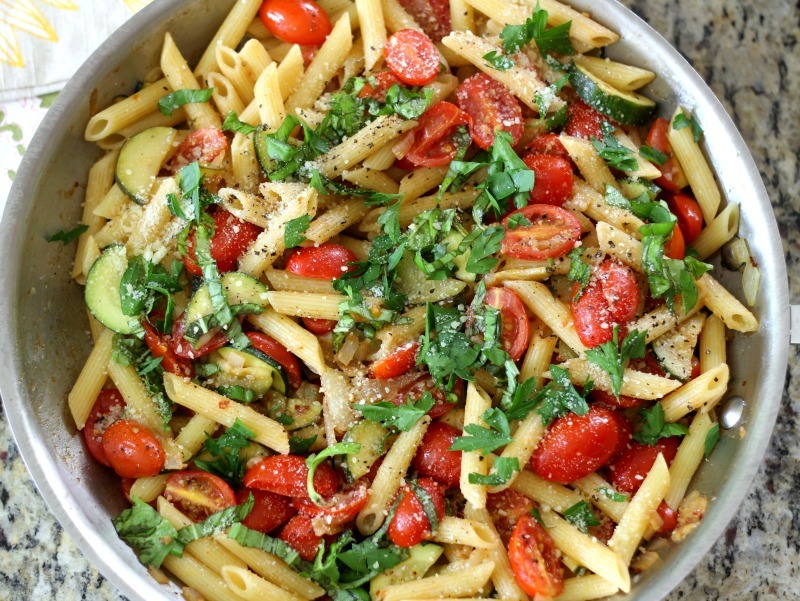 So today I have for you a simple 20 minute pasta dish made with fresh tomatoes, zucchini and seasoned with fresh herbs that I picked up at the Farmers Market. I just love this dish and it doesn’t take a lot to give it so much flavor. 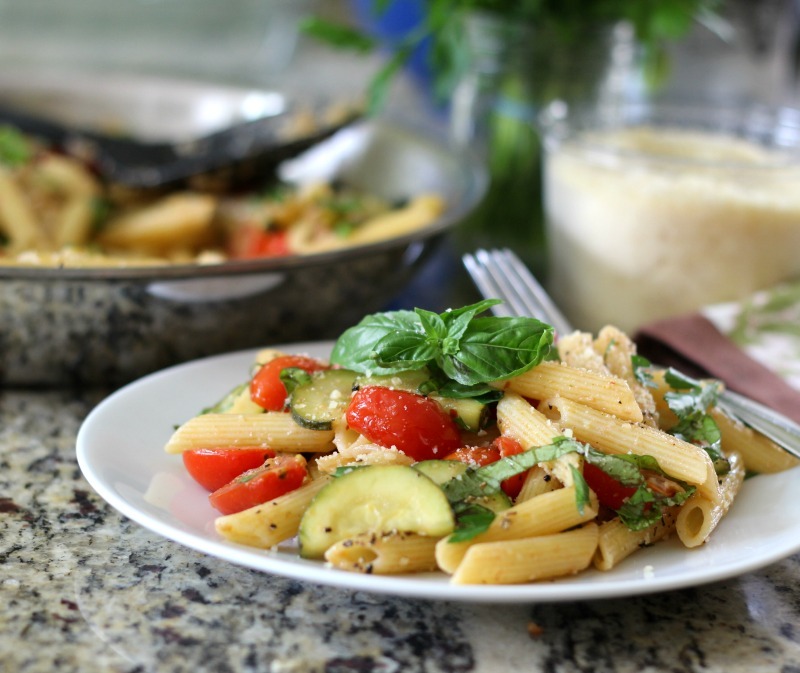 It’s rich in flavor, fresh tasting and ohhhh the Parmesan cheese gives it a nice salty and savory flavor. It’s still a little early for tomatoes, so I picked up some grape tomatoes from Trader Joe’s. I did manage to pick up some fresh organic zucchini which I sliced up and placed in my pasta. The whole recipe takes about 20 minutes to whip together, not including waiting for the water to boil for the pasta. The base of the recipe is made of olive oil, garlic and onions, with a little bit of chili flakes for a little added heat. I cooked until tender then added my sliced zucchini. No need to peel it, just slice it thin. Once the zucchini started to softened up I added the tomatoes and a little bit of balsamic vinegar for additional flavor. Toss in the pasta, mix until combined and of course sprinkle with Parmesan cheese. Yum! I love the addition of the fresh herbs too. Parsley and Basil added just another dimension of flavor. You really can’t go wrong with this dish. 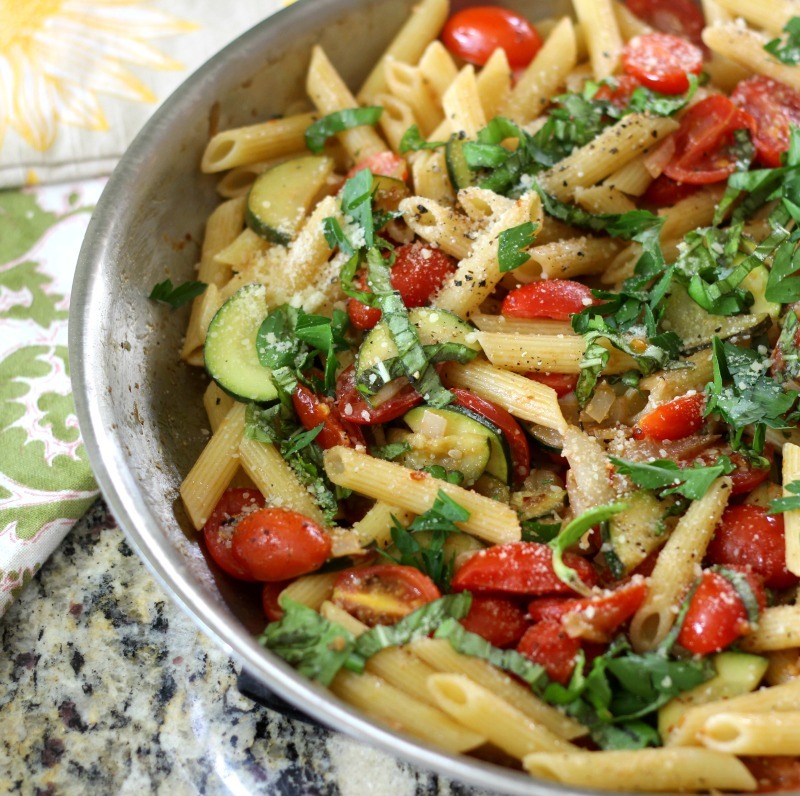 An easy 20 minute pasta dish with rich flavor made with fresh tomatoes, zucchini, balsamic vinegar and seasoned with fresh herbs. While pasta is cooking; in a large frying pan over low heat add olive oil, onion, garlic and chili flakes. Stir for 3 minutes, until onions are tender. Add zucchini and cook for 3 more minutes, stirring so the zucchini doesn't stick. Add tomatoes and balsamic vinegar, and cook until tomatoes start to burst; about 3 minutes. Toss in cooked pasta. Mix until combined and sprinkle with Parmesan cheese. Mix until cheese starts to melt; about 30 seconds. Turn off heat and add basil and parsley. Season with salt and pepper to taste. Can be stored in the refrigerator for about 3 days. Warm up in the microwave for 2 minutes. I made this recipe on Sunday, so I could eat it throughout the week. I like making meals in advance and then just heating it up during the week. With 10 hour work days, the last thing I want to do is come home and cook. To heat up, I just place how much I want on a plate and drizzle a little olive oil over it and microwave for two minutes. 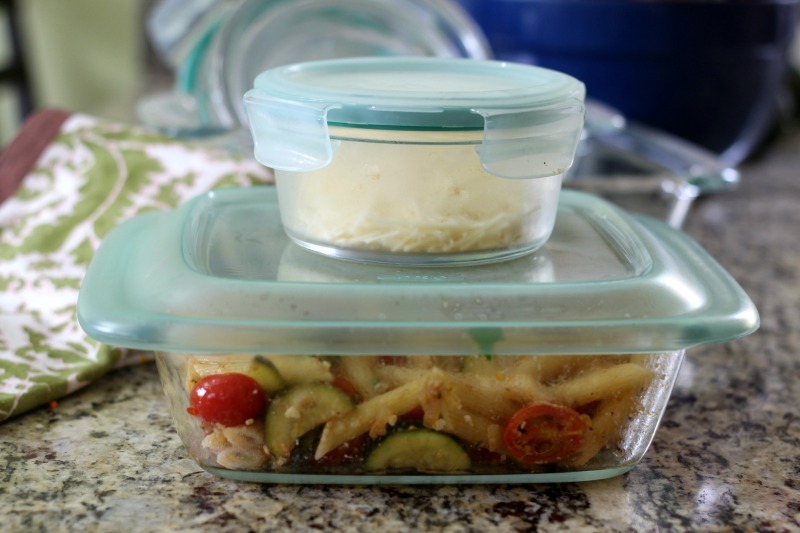 I store my pasta in my OXO Glass Bakeware and Food Storage. I’m telling you these containers rock! I keep them on my kitchen counter for easy grabbing. I hope you enjoy this 20 minute meal as much as my Husband and I. Actually this will sound strange but my Husband added low sodium soy sauce to it, why I don’t know? But it tastes pretty good that way too. He comes up with some crazy combinations. Made this tonight. It lacks flavor. Noodles are bland despite the garlic and the “bursting tomatoes” something is missing.